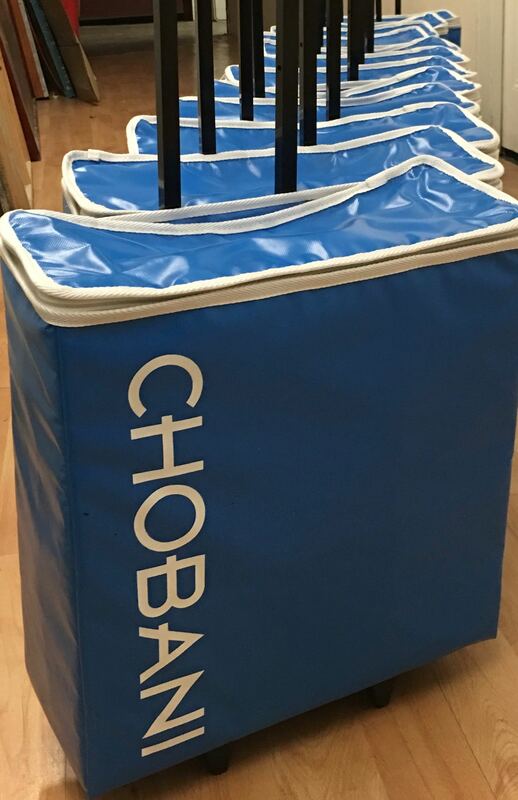 These insulated snack pack coolers also have wheels and a telescopic handle. 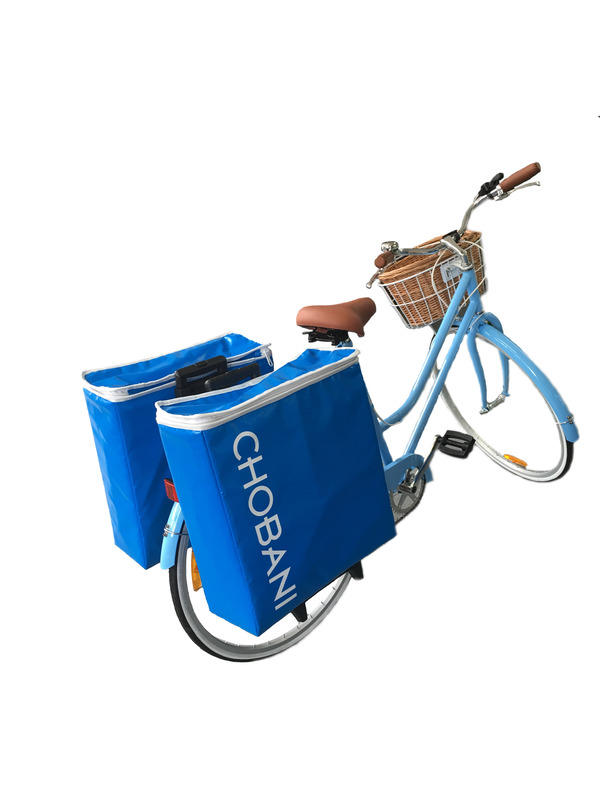 The bike rider would be able to detach the pannier bags and wheel them to and from the supply van for replenishment. These coolers have a Polycarbonate internal shell. Promotion is rife in the marketplace, in this case I was asked to produce branded, insulated, backpacks for dispensing samples of yoghurt. The packs had an internal divider for multiple products and neoprene defence for the zip openings. With top loading the wearer would be able to distribute samples by reaching around and pulling the product out of the lower zip access points. These stackable cooler bags are insulated and also have a polycarbonate shell. There are pockets on the inside to add ice packs for chilling the products inside. Up to four cooler bags can be stacked inside a pushcart and rotated as necessary to access all bags of product. MY SHOW’S AS FLEXIBLE AS I AM! WHATEVER YOUR EVENT, I CAN BEND MY SHOW TO FIT. I CAN WOW YOUR CROWD WITH A QUICK 1-MINUTE STUNT, OR STRE——ETCH THE PERFORMANCE TO A FULL 45-MINUTE EXTRAVAGANZA CLIMAXING WITH ME SQUEEZING MYSELF INTO A TINY 16” PERSPEX BOX. MAYBE YOU’RE LOOKING TO ADD SOME FLARE TO YOUR NEXT CORPORATE FUNCTION, OR BRING SOME WOW FACTOR TO A PRODUCT LAUNCH, OR EVEN RAISE SOME EYEBROWS AT AN UPCOMING PARTY – I CAN HELP MAKE YOUR NEXT EVENT SPECTACULAR! I was approached to prototype and produce a sample of a set of backpacks. These packs would contain special weights in two sizes for commando training. Each pack was designed to be used on the front or back or both at the same time, to be used to transport the weights from Point A to B. An embroidered logo was incorporated as well. This creative genius is a do-it-yourself type of guy but sometimes he needs a little help. Wether it’s a costume or three, A windscreen replacement, A fire-stick bag, or a some soft toy/costume conversion. I’ve been there for him, he is also the proud owner of a one-off PV1 messenger bag. This costume, while a work in progress is fully functional with a leather rear end, for fire protection. Being a Fire Juggler, them sticks can get dirty and smelly. This rollup style bag kills two birds with one stone. This Map was made for the Newtown Festival, locals were able to walk over it to place their name where they lived on the map. BIKE GEAR BAG CONTAINS: WET WEATHER GEAR, PUMP, 2x TUBES, REPAIR KIT, TOOLS, LIGHT, LOCK.